Become King/Queen of the campsite with the One-Burner Multi-Fuel Camp Stove. This lightweight stove travels to and from your base camp easily and safely with the included hard carrying case. Stress less on what gas you'll need and worry more about what masterpiece to cook upon your arrival because this stove runs on butane and propane. Manage the powerful 8,000 BTU burner with the adjustable heat control and convenient matchless ignition. Pick up this killer one-burner camp stove for all of your camping and off the beaten path adventures. Venture into the great outdoors with the Propane Camping Cylinder 4-Pack. Perfect for on-the-go cooking, grilling, heating and lighting. The lightweight, universal design is compatible with most portable stoves, lanterns, heaters and outdoor appliances. Constructed of durable steel with reliable valves that are safe and easy to use. Includes four cylinders. Make your favorite breakfast or hot sandwiches at the campsite on the Universal Fry Griddle. Its sloped sides make cooking easy and will keep the mess to a minimum. This durable griddle has a handle for easy transport making it great for home or the tailgate party. Designed to fit Camp Chef's 14" cooking systems, it can also fit on 16 inch Cooking Systems by rotating 90 degrees. This griddle is perfect for all kinds of outdoor cooking. Also fits many other outdoor stoves. The Koolatron P25 Fun-Kool Thermoelectric Cooler has a 24-liter capacity. Just plug it into any 12 volt power receptacle for hours of cooling power. You can also use the AC Adapter, sold separately, to plug the P25 Fun Kool into any household outlet. State-of-the-art thermoelectric cooling technology ensures your food and drinks are kept at a temperature up to 40 F below ambient levels.This 12V mini fridge is the perfect complement for a day trip, picnic or grocery store visit. The portable mini fridge is cool down quickly and will keep chilled foods from going bad while in transit. The outlet cord fits easily in the extra storage compartment, so it won't be misplaced. One-Burner Multi-Fuel Stove Become King/Queen of the campsite with the One-Burner Multi-Fuel Camp Stove. 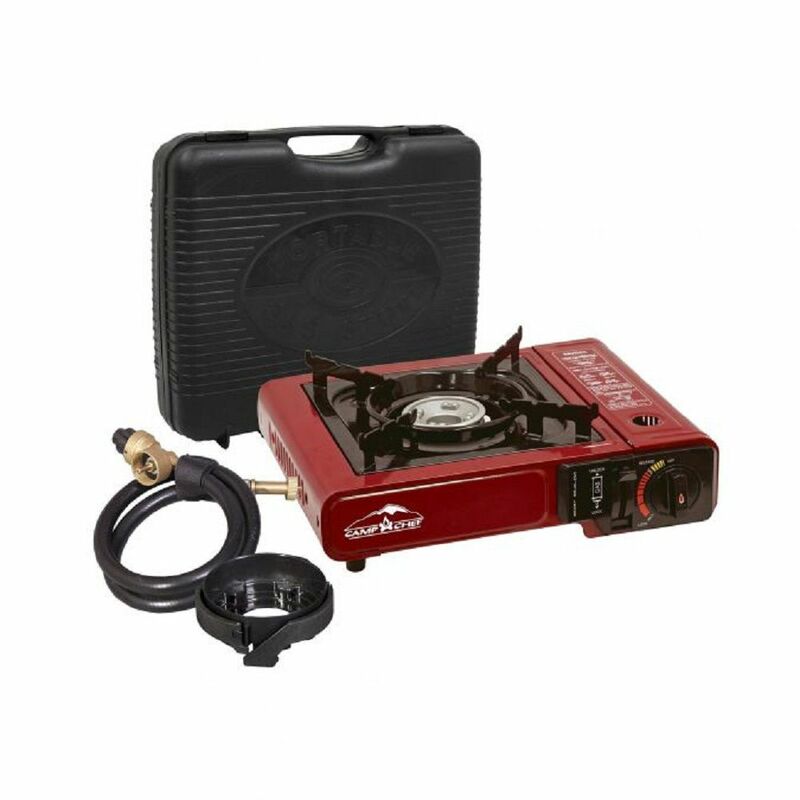 This lightweight stove travels to and from your base camp easily and safely with the included hard carrying case. Stress less on what gas you'll need and worry more about what masterpiece to cook upon your arrival because this stove runs on butane and propane. Manage the powerful 8,000 BTU burner with the adjustable heat control and convenient matchless ignition. Pick up this killer one-burner camp stove for all of your camping and off the beaten path adventures.